Welcome back for another episode of Sites, and another week of adding a strategy to your toolbox that will help you create a powerful and successful WordPress website. Last week we discussed content — specifically, the persuasive power of analogy, and I challenged you to make your best attempt at working an analogy somewhere into your website or email copy. I hope that went well. This week, we’re going to roll design, technology, and strategy all into one by discussing some proven tips that will help you improve the speed of your WordPress website. As an important bonus, these tips are all SEO-friendly. And that’s important. The last thing you want to do is make an enhancement in one area of your site that has negative side effects in another area. And it makes sense — we would expect most site speed improvements to help out with SEO, because better speed leads to a better user experience, and because of the increasing importance that site speed and performance have as indicators that search engines look at. So let’s dive in and discuss these SEO-friendly tips that will make your WordPress site faster. And you don’t have to take my word for it. Today’s episode is based on a blog post over at Copyblogger by Loren Baker, the founder of Search Engine Journal and the Vice President of Foundation Digital, an SEO & digital marketing agency. Loren was one of the early pioneers in online SEO education, and he really knows his stuff. So make sure you earmark at least one of these tips for immediate implementation on your website. Hint, hint. Call to action. Okay, without further ado, here is my reading of Loren Baker’s blog post 6 SEO Friendly Tips to Improve Site Speed on WordPress Blogs. In the world of SEO, user experience on websites has always been a factor, as has the time it takes for a site to load. However, with the use of mobile devices surpassing desktop use (in most consumer-facing industries) and the wide adoption of broadband, people expect sites to load instantly. Long gone are the days of waiting 10 seconds for a site to load. If a page takes more than a couple of seconds to load, users will instantly hit the back button and move on to the next result. Accordingly, Google officially started paying attention to site speed and declared its importance as a factor in rankings. In order to keep up with Google’s site-ranking measures, WordPress blog users need to know exactly what they can do to improve their own site speed. Remember when Google rolled out AMP (accelerated mobile pages)? I’d rather speed up my blog and attract traffic directly to my site than have users stay on Google. If you use StudioPress Sites or the Rainmaker Platform, your site will already load quickly. However, adding ad scripts, featured images, tracking codes, 301 redirects, etc. will slow down the loading of a site and increase demand on your server/hosting company. Here are six simple tips I recommend since we used them to dramatically speed up the Search Engine Journal (SEJ) load time — it’s at 1.8 seconds! A content delivery network (CDN) is a group of servers that deliver web pages and other content according to the location of the user, the webpage origin, and its server. It can handle heavy traffic and speeds up the delivery of content to different users. For WordPress blogs looking to improve site speed, Cloudflare is a great tool to consider. Cloudflare offers a free content delivery network that speeds up the performance of your site and optimizes it for efficiency on any device. It also offers security services that help protect websites from crawlers, bots, and other attackers. Another effective way to reduce page-load time and increase site speed is by compressing your images. A CDN will help with this, but it doesn’t take care of 100 percent of the job. There are several different plugins available that compress all the images on your website — and even compress new images as you upload them as well. ShortPixel is a WordPress plugin that allows you to compress both new and old images on your blog. We use it on SEJ and various other sites, and absolutely love it. It allows you to quickly compress images in batches for greater convenience, reduces the time it takes to do backups, and ensures all your processed files are kept safe and secure. The best part about it is that your image quality stays the same, regardless of the size of the image. Other image-compression plugins also maintain the quality of your pictures and improve site speed. Many web pages today contain some form of third-party script that either runs ads for revenue or uses pop-ups to promote conversion. You want to build your audience and get more customers of course, but balance is key here. Although it’s difficult to completely get rid of them to improve your site speed, you can tame their performance impact while keeping them on your website to provide their intended benefits. The trick is to first identify the third-party scripts that run on your site, where they come from, and how they impact your blog. You can use different real-time monitoring tools that track and identify which scripts delay your site-loading time and affect your site metrics. One of my favorite tools to do this is Pingdom’s Website Speed Test, because it breaks down each file and script, and tells you which takes the most time to load. The same rule applies for pop-up plugins that you add on to your site. Knowing which ones work best to improve conversions and bring in email signups allows you to gauge which plugins to keep and which ones to uninstall. One of the fastest pop-up plugins on the market is OptinMonster (a StudioPress partner). Its founder, Syed Balkhi, is a WordPress expert who stays on top of factors like site speed and overall user experience. Next, we’ll discuss numbers 4-6. Another effective way to reduce site-loading time is by installing caching plugins onto your WordPress blog. Caching plugins work by creating a static version of your WordPress blog and delivering it to your site users and visitors, which conveniently cuts your page-loading time in half. Several cache plugins work best for WordPress, such as WP Super Cache and W3 Total Cache. These plugins are easy to install and can be disabled anytime. They allow you to select certain pages on your blog (or all of them) to cache, and offer many other content compression settings that you can turn on or off. WordPress supports many other plugins that allow you to optimize your blog to get rid of any latency in page-load time. It is important to test out these plugins to find the one that works best for you. Tons of WordPress plugins can also make your site super slow, especially ones you don’t need. It is important to review the plugins you have installed in the past and disable those that offer no significant value. Many WordPress users install different plugins when they first create their blogs to enhance how they look, but realize over time that great-looking blogs don’t always attract traffic, especially if your page-loading time is slow. Also, I would highly recommend making sure your plugins are updated. This may help improve page-load speed, but more importantly, it makes your site more secure. We discussed this topic in more depth back in episode 15 of Sites. One thing we realized at SEJ when speeding up the site was that even after optimizing images, ad scripts, and caching, there were still multiple forms of media that slowed down load time. The internal fixes we implemented did not help with third-party media load times, such as embedded Twitter, YouTube, and Instagram content, or infographics from other sites. One solution we found to assist with that is BJ Lazy Load. Essentially, this lazy-load plugin renders all written content first, then as the user scrolls down the page, images and other forms of media load. This way, the user doesn’t have to wait for tons of media to load before reading the main content. What I really like about BJ Lazy Load is that in addition to images, it also lazy loads all embeds, iFrames, and YouTube videos. For a WordPress blog that uses a lot of embeds, it was ideal for us. If you run a WordPress blog or WordPress-powered site, then you should work with a hosting company that specializes in WordPress, such as WP Engine, Presslabs, or StudioPress Sites. I’ve worked with all three, and one thing I can absolutely tell you is that if you contact them and ask how your site can be sped up, they will help you because the faster your site is, the less the load is on their servers. As more and more people turn to mobile devices to access the internet, it is essential to optimize your blogs for mobile use and find ways to minimize page-loading time. Remember, bounce rates increase when your page-load time is slow, which impacts whether or not your content gets read or skipped for other sites that load pages faster. Simple CTA this week: pick one of the six, actually seven, tips … and just do it. Maybe you sign up with a content delivery network. Maybe you add a plugin to compress your images. Perhaps you just email your host and ask them for tips on how to optimize your site. But take a step toward a faster site. The benefits really are endless, because, as Loren said, a faster site leads to a better user experience, which leads to fewer bounces and longer time on site, which leads to better search rankings, which leads to more visitors who are having a good experience … and on and on. This is like a gift to your audience that keeps on giving — which makes it like a gift to yourself too. Okay, that’s it for this week. Stay tuned for our next episode. 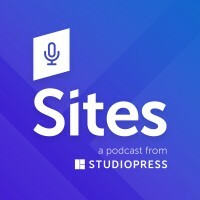 I’ll have a special guest with a special announcement about the future of the Sites podcast.